using an electric pressure cooker. 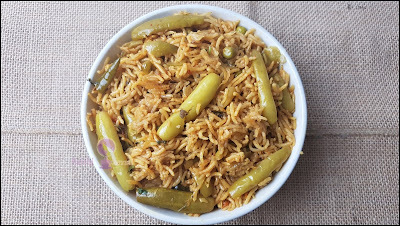 It is very simple and easy to make pulao dish, need no fancy preparations and pairs perfectly with any raita or curry. It is perfect for kids tiffin box or for weeknight dinners too. Ivy gourd is one of the healthiest vegetables. I have prepared this tendli pulao first time using instant pot, and it turned out so flavourful and fluffy! This vegan and gluten-free pulao recipe is perfect for quick lunch/dinner. 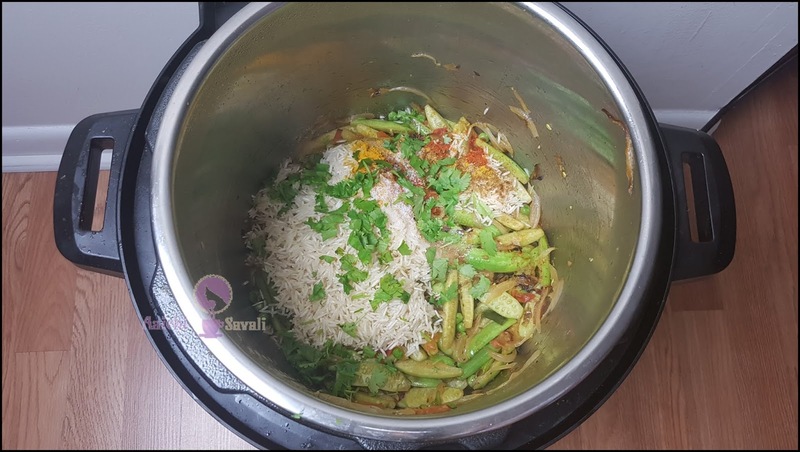 Nowadays instant pot is my go-to hands-free device when it comes to cooking so many recipes. 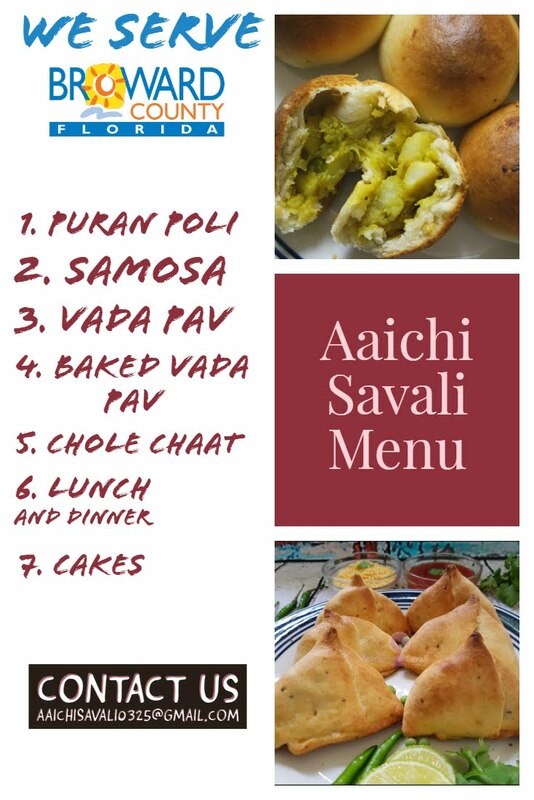 From simple pudding to carrot halwa(fudge) to any meat and so many more recipes. 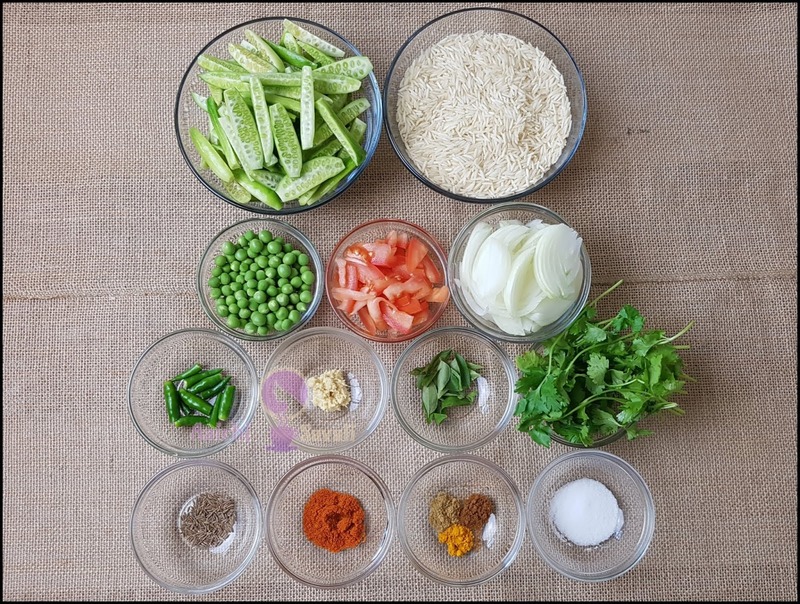 The best part is that you just need to throw all the ingredients and set the cooking time and after cooking time over your meal is ready to serve. If you own this electric pressure cooker, you know how valuable this is. It saves your tons of effort on preparing everyday dishes and your time. This beginner-friendly pulao is nutritious, and it receives richness and flavor from healthy Ivy gourd and Indian spices. 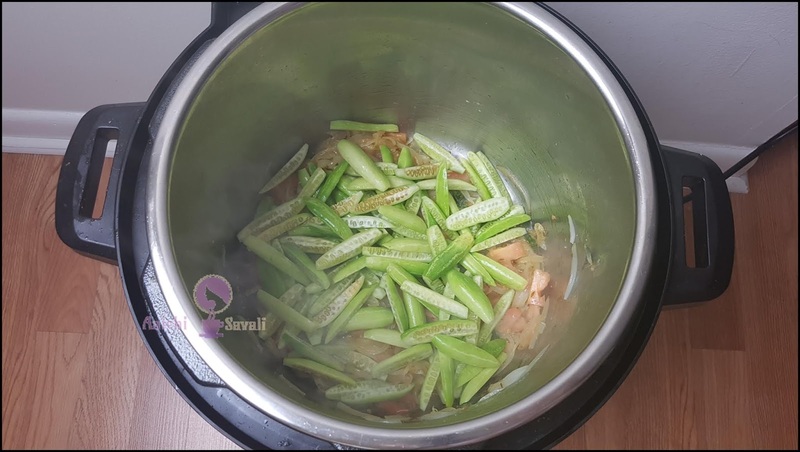 Ivy gourd is prepared in a variety of ways that take advantage of its versatility and its subtle flavor, which goes well with healthy spices. It's often prepared with veggies and potatoes or stuffed with spices and then fried in oil or used in a stir-fry with coconut milk and spices. Also, it has plenty of nutritional value. It is a good source of vitamins, minerals, and antioxidants that can be helpful in preventing and treating disease. 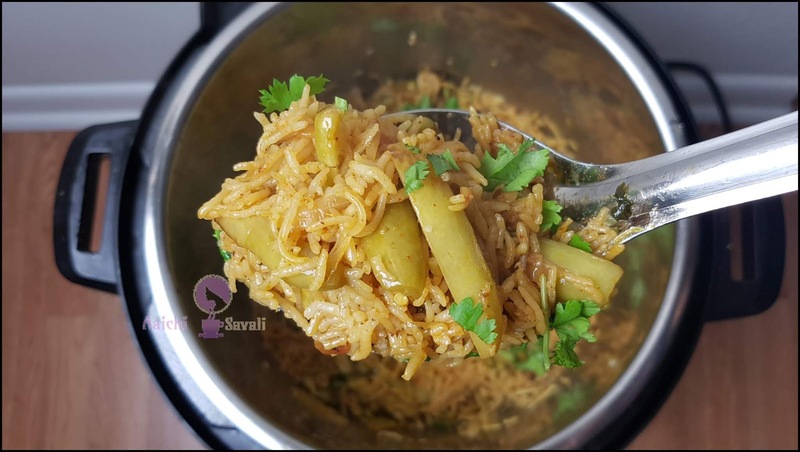 Ivy gourd pulao is a highly palatable assortment of rice and ivy gourd cooked along with garam masala. It tastes heavenly when served with a dollop of ghee or with sol kadhi. Preparation of ivy gourd has many variations across various states in India depending on the region and taste. Wash rice under tap water and keep aside. and splutter cumin seeds and curry leaves. 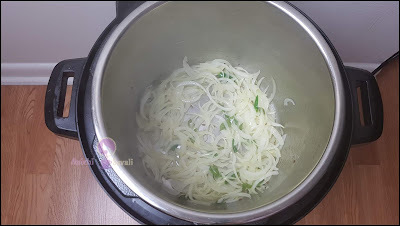 Now add chopped onions stir-fry for 2 to 3 minutes or until the onions start to turn brown. Add ginger garlic paste, chopped tomatoes and cook until the tomato begins to break down. Add sliced tindora/tendli and green peas, saute and cook for a minute. 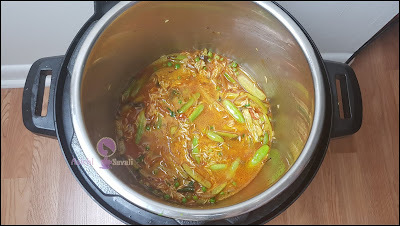 powder, turmeric powder, garam masala, coriander powder, salt and half of the coriander leaves and mix well. Add water 2 ¼ cups and close the lid, place the vent on sealing position, and cook for 6 minutes at high pressure. Naturally release the pressure for 10 minutes, then move the valve to release any remaining pressure. Tadaa, a healthy bowl filled with veggies and nutrients, is ready to serve, serve with raita, curd or with any curry. Enjoy!!! It makes 8 servings, and calorie count is based on a 2000 calorie diet. calories, along with 35.21 g carbohydrates, 4 g fats, and 4 g protein. Ivy gourd facilitates digestion. It contains fiber that aids in digestion. It also cures other gastrointestinal disorders like constipation, ulcers, and disease. Ivy gourd can help regulate blood sugar levels and, in turn, prevent or treat diabetes. It is filled with vitamins such as beta-carotene, vitamin A, vitamin B1, and B2. It is good to eat Ivy Gourd Pulao for lunch and for dinner.